I know what your thinking…cauliflower… it’s not that tasty. I hate it, ugh how could you eat it?? Well I promise you, it’s not any of the above. Blanching and slow roasting, allows it to tenderise and burst with flavour. I learnt this cooking method whilst attending a course recently with the Dublin Cookery School and it’s been a constant on my weekly menu since! 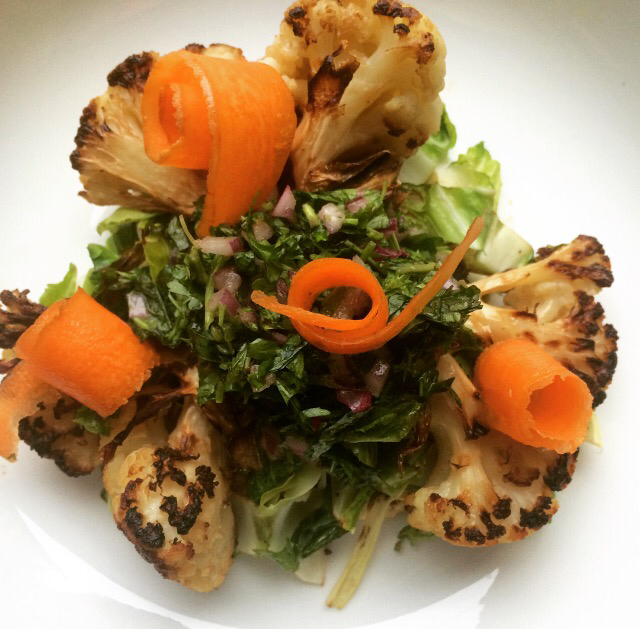 The cauliflower is perfect on it’s own as a side dish or add some salsa verde, carrot ribbons and sauteed cauliflower leaves for some colour and texture as a main dish. It also works great with a big juicy steak or roast beef. Bring a large pot of salted water to the boil and pre-heat an oven to 180°C. Peel the leaves off the cauliflower, roughly chop the inner paler coloured leaves for later. Divide the cauliflower into florets or wedges. Once the water is boiling, add the cauliflower wedges and blanch for 2 mins. Remove with a slotted spoon and place in a bowl. Add 1 tsp coconut oil to a large baking tray and melt in the oven. Add the blanched wedges onto the tray with the peeled garlic cloves and thyme. Stir to combine. Place the tray in the oven and allow the cauliflower to roast for 20-30 mins until soft through. Prepare the salsa verde. For the carrots, use a vegetable peeler to create long thin carrot ribbons, stir through the olive oil and apple cider vinegar until lightly dressed. Place both in the fridge until required. Once the cauliflower has roasted, remove from the oven and cover with tinfoil to keep warm. Place a pan on a medium heat and lightly sauté the roughly chopped cauliflower leaves. To serve: place a layer of cauliflower leaves, top with the cauliflower wedges/florets, spoon over the salsa verde and add the carrot ribbons to finish.